It’s not everyday you get to hear from world renowned cancer specialist and surgeon, Dr. Bernie Siegel. 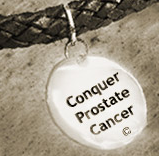 As some of you may know he's one of the many luminaries who endorsed my book, Conquer Prostate Cancer. Today I received a note from him about an exciting two-day telseminar series he's participating in, presented for free next week on December 11th and 12th. The series is called The Next Evolution of Health Summit. It’s a no-cost phone event featuring the top pioneers in health, wellness and mind-body-spirit medicine. They will all share their latest insights and innovations about sustaining your health, whether you are a prostate cancer patient or survivor or not. Apart from Bernie, who’s always a captivating speaker, you’ll hear firsthand from luminaries such as Dean Ornish, Joan Borysenko, Marilyn Schlitz, Bruce Lipton and Judith Orloff and many others. You can participate in as many phone sessions as you like by registering at http://nextevolutionofhealth.com. I hope you’ll take the time to listen to these amazing health pioneers next week. If you sign up, you can also receive recordings of all the presentations and listen in at your convenience.